Story by Shelly - Illustrations by Beth! This the first in the series of the Angel Saga! More will be coming soon! I hope you will enjoy this series of Fallen Angel stories! I rate it PG, because it does contain some violence, but no sexual situations. My Story is a work of pure fiction. The characters, incidents, and dialogues are products of my imagination and are not real. Any resemblance to actual persons or events, living or dead, is entirely coincidental. I am NOT affiliated in any way with Hanson, nor have I ever met them. So sit back and enjoy and good reading! 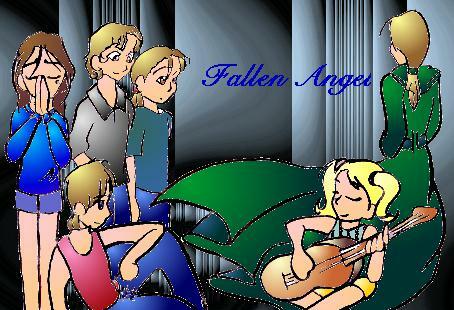 The Fallen Angel Geocities Site! She can't update the page anymore due to a mix up and will have all her Fallen Angel sagas moved over to my page for your reading pleasure. So please be patience as we shift all the stories over here. Thanks!